Loxeal aims to pursue the market competitiveness as well as the customer satisfaction, with a policy of innovation and economic growth in the full respect for the environment. Certificates and approvals achieved over many years are the best warranty of our jobs and products quality. 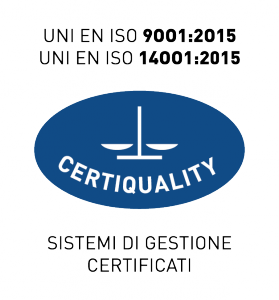 UNI EN ISO 9001 – Sets the objective to meet customers’ needs, being able to understand and to anticipate their implicit and explicit needs, and to offer a service that meets all of them. In order to get this goal, we analyze processes to improve effectiveness and efficiency and pursue continuous improvement. UNI EN ISO 14001 – Certificates the commitment to comply with existing environmental legislation and work with the target to reduce pollution, to promote the reasonable use of available resources and to develop products with the lower environmental impact. Regularly monitor the activities and the process parameters that influence the overall environmental impact of its production sites. Finally protect the interests of local Communities and, more generally, of the civil society, actively cooperating with the Authorities, the Organizations and the local Governments.